The first mobile HIV testing lab in Africa was based at a card table. "I’d drive up to the hospital in a beat-up Jeep with my lab equipment and set up a card table in the open-air waiting area," recalls Susan Allen, who began her research in Kigali, Rwanda, in 1986. Allen’s subsequent discovery that almost one-third of the pregnant women whom she tested had antibodies against HIV led to a follow-up project, supported by the NIH, that studied not only the women but also their spouses. 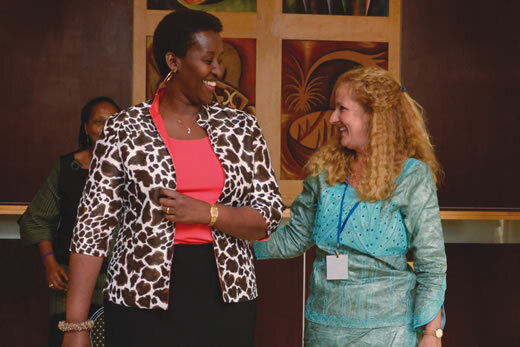 In 2012, the project marked its 25th anniversary with a conference opened by Rwanda’s First Lady Jeanette Kagame. "What began as a humble effort in Kigali 25 years ago, has grown to become an international advocate for affordable and effective HIV prevention, a world leader in vaccine development efforts, and a respected partner in global health," Kagame told the New Times, a daily newspaper in Rwanda. During the Rwandan genocide in 1994, many of the participants in the original study were killed, along with half the staff. For safety, the project relocated to Zambia. It took several years before Rwanda stabilized enough to convince funding agencies that it was safe. Eventually, the Rwanda Zambia HIV Research Group went on to conduct the first HIV vaccine trials. Allen’s early finding that many of the women tested lived in a discordant relationship surprised scientists at the time. Since then, her research has provided critical data about HIV transmission and prevention methods and this year led to the adoption of guidelines by the World Health Organization that couples should get tested for HIV together. "The couples testing policy is something to celebrate," Allen says. "Without the work in Rwanda and Zambia, this would not have happened." The new guidelines were designed to help partners in a stable relationship work together to prevent the uninfected person from getting the virus. Low-tech, inexpensive prevention methods like couples testing and counseling plus condoms are just as important as antiretroviral therapy in this effort—and far more affordable and sustainable in the long run than drug-based strategies, Allen says. The most important research effort now is to develop a vaccine.